Herbs, perennial, cespitose, light green to olive when dry, to 5 dm, often somewhat glaucous. Stems branched, with 1 or 2 nodes, 1-2(-2.3) mm wide, glabrous, margins entire to denticulate apically, occasionally white-cartilaginous; first internode 8-34 cm, usually longer than leaves; distalmost node with 2-3 branches. Leaf blades glabrous, bases not persistent in fibrous tufts. Inflorescences borne singly; spathes green, obviously wider than supporting branch, glabrous, keels entire to denticulate; outer 11-26 mm, 2.5 mm shorter to 5 mm longer than inner, tapering evenly towards apex, margins basally connate 3.3-8 mm; inner with keel evenly curved to straight, hyaline margins 0.2-0.4 mm wide, apex acute to acuminate, ending 0.1-1.1 mm proximal to green apex. Flowers: tepals dark bluish violet, bases yellow; outer tepals 6-15 mm, apex rounded to acute or occasionally emarginate, aristate; filaments connate ± entirely, stipitate-glandular basally; ovary similar in color to foliage. Capsules beige to tan, globose, 4-7.5+ mm; pedicel erect to ascending. Seeds globose to obconic, lacking obvious depression, 0.8-2 mm, granular or slightly rugulose. 2n = 32, 64. Flowering mid spring--early fall. Moist areas, springs, stream banks, meadows, forest seeps; 500--2900 m; Ariz., Colo., Nev., N.Mex., Tex., Utah; n Mexico. 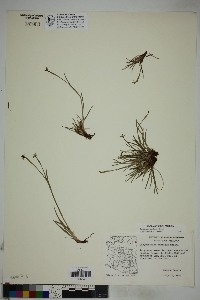 Previously, we (A. F. Cholewa and D. M. Henderson 1984) misidentified the octoploid northern Utah populations of Sisyrinchium demissum as S. radicatum. New data indicate that these northern Utah populations rightly belong here as a polyploid race of S. demissum. Also see discussion under 18. 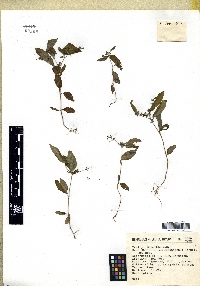 S. radicatum. 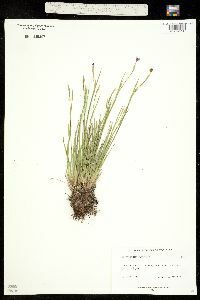 Plant: perennial herb; erect or lax, to 50 cm tall. ROOTS fine to somewhat thickened. STEMS (0.8-)1-3.2 mm wide, branched, nodes 1-2, the uppermost with 2-3 peduncles, the margins generally entire, the surface glabrous Leaves: folded lengthwise in iris-like fashion but somewhat flexuous, mostly basal and distichous, the margins slightly hyaline basally; 1.3-4.5 mm wide INFLORESCENCE: an umbel with 2 spathe bracts, the lower (outer) bract enclosing the other (inner); SPATHE BRACTS with the dorsal keels generally entire, subequal in length or occasionally the inner longer than the outer; outer bract 11-26 mm long, tapering evenly to the apex, the margins connate basally 3.3-8 mm; inner bract 12-26 mm long, the hyaline margin narrow to moderately wide, ending just below the apex, the base tapering evenly to slightly curved Flowers: blue-violet with yellow bases; pedicels erect or ascending, glabrous, at anthesis equaling or longer than the inner bract; tepals 6-15 mm long, the outer with obtuse to retuse, apiculate apices; anthers 0.6-1.7 mm long; filaments completely united; ovary glabrous, pubescent or glandular pubescent Fruit: a capsule, 3-7.5 mm long, obovoid to nearly spherical, straw-colored or beige; SEEDS 0.8-2.0 mm long, oblong to nearly spherical or angular, the surface smooth or granular Misc: Wide ranging in ephemeral ponds, wet or moist meadows, streamside, gravel bars and springs from the Sonoran Desert to spruce forests (rather tolerant of grazing and trampling, which tends to produce stunted plants with smaller flowers); 550-2900 m (1800-9500 ft); Apr-Oct REFERENCES: Cholewa, Anita F. and Douglass M. Henderson. 1994. 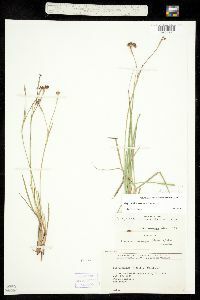 Iridaceae J. Ariz. - Nev. Acad. Sci. Volume 27(2), 215.